Supporters of the UK staying in the EU demonstrate outside the Houses of Parliament, as uncertainty over the UK's role in Europe continues. LONDON -- The group representing automakers with UK operations reacted angrily to the continued uncertainty surrounding the country's future trading relationship with the European Union after Brexit was pushed back by almost seven months. 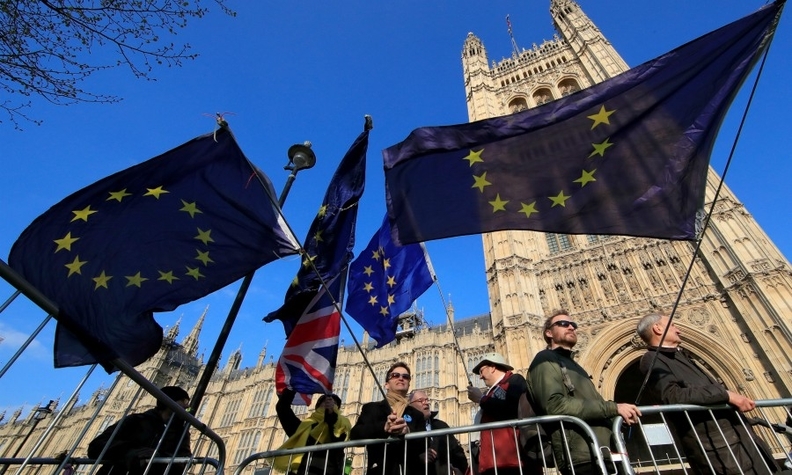 The EU agreed on Wednesday to extend the date of the UK's withdrawal from the trading bloc to Oct. 31 after the British government failed to reach a parliamentary consensus on Prime Minister Theresa May's exit deal. "It is utterly unacceptable that, more than two years since negotiations started, industry still does not know what the UK's relationship with the EU will be in the coming weeks and months," Mike Hawes, CEO of the UK's automakers' association, the SMMT, said in a statement. Using some of the strongest language the association has deployed yet, Hawes said the government's continued refusal to rule out a no-deal Brexit with its associated tariffs "cannot go on." "Uncertainty has already caused serious damage -- car plants are on enforced shutdown, investment has been cut and jobs lost," he said. "Government and Parliament must use this extension purposefully to take 'no deal' off the table for good and guarantee a positive long-term resolution that delivers frictionless trade. If they fail, we face yet another devastating 'no deal' precipice on 31 October." BMW's Mini and Rolls-Royce, PSA Group's Vauxhall unit and Jaguar Land Rover shut down UK plants at the beginning of this month to manage any possible upheaval related to the first withdrawal deadline of March 29. The date was then pushed to April 12 before the latest postponement to Oct. 31. Automakers have consistently opposed a no-deal and have threatened to shift some production out of the UK in reaction to the increased border friction and tariffs into the EU, which is the country's biggest market and largest external source of parts. Britain's car industry is in danger of "death by a thousand cuts," Matthias Holweg, a professor at Oxford's SAID Business School wrote in a report. "Uncertainty caused by Brexit is a real problem that has already caused measurable damage," he wrote. Holweg said a no-deal Brexit could cut automotive manufacturing to below one million cars a year by 2025, down from 1.52 million in 2018. "The damage that it has done can already be seen, and the likely future damage that trade friction or tariffs will cause can be estimated," he said. Uncertainty is causing UK plants to lose out on investment, Holweg said. "Since the Brexit referendum [in 2016] all but one major decision have gone against the UK," he said. Honda has said it will shut its plant in Swindon in 2021, while Nissan decided against building its new X-trail SUV at its factory in Sunderland. Nissan also decided to end production of the slow-selling Infiniti Q30 and QX30 compact premium cars currently built in Sunderland. Holweg said investment in the UK automotive industry has dropped by 80 percent in the last three years. Contractions in the global car industry are partly forcing investment changes, making it more difficult for the UK to compete, he said. "Brexit hits the UK car industry at a time when it is particularly vulnerable," he said. UK car manufacturing fell 17 percent in the first two months, figures from the SMMT show. Last year production fell 9.1 percent to 1.52 million. Engine production has fallen 8.3 percent in the first two months after remaining broadly stable last year.